We have another returning Tattooed Poets Project alumnus today, David.Jonathan Newman. David's previous contribution appeared two years ago, here. "...a three-quarter sleeve on my left arm by none other than the famous Bruce Kaplan, owner of Lark Tattoo in Wesbury NY and Albany NY. We've both been very excited about this project and it's been in progress for over a year now; excited to be getting well into the color portion of it. Essentially, the tattoo is Bruce's take on a wicked thunderstorm; tidal waves, thunder and lightning, intimidating clouds and fire. 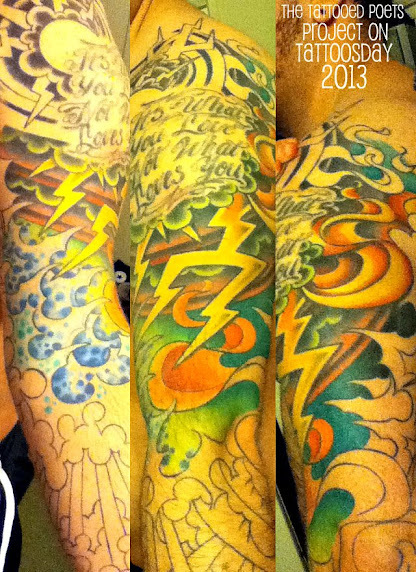 Towards the end of the tattoo down by my forearms, the sun's rays come out through the cloud cover and the storm breaks. I've been through a lot in my life (just like many people) and this tattoo, like many of mine, is meant to remind me that I can get through every hardship I have coming; and that I was able to get through everything that's been thrown at me so far. The quote in script was a previous tattoo that Bruce has been going around... it was done years ago by Chris Koutsis at DaVinci Tattoo in Wantagh NY. It says It's What You Love, Not What Loves You and was inspired by the Charlie Kaufman movie Adaptation." David Jonathan Newman has been a poet and vocalist/lyricist in bands, both on Long Island, NY and in Miami, FL. He is working on a collection of poetry, writes music as a solo artist and has a blog (http://captainselfdestruct.blogspot.com) where he posts both his solid works and stream of consciousness ideas. He's been winning poetry contests since 6th grade, but recently he's been featured in online publications including Haggard & Halloo Publications, quite a few times - and even the Tattooed Poets Project, back in 2011. He's currently floundering back and forth between wanting to pursue his poetry pseudo-career to get more of his work out there, and the soul-crushing hopelessness that any poet feels, wanting to pursue their medium in the year 2013. Thanks to David for once again contributing to the Tattooed Poets Project on Tattoosday! This entry is ©2013 Tattoosday.